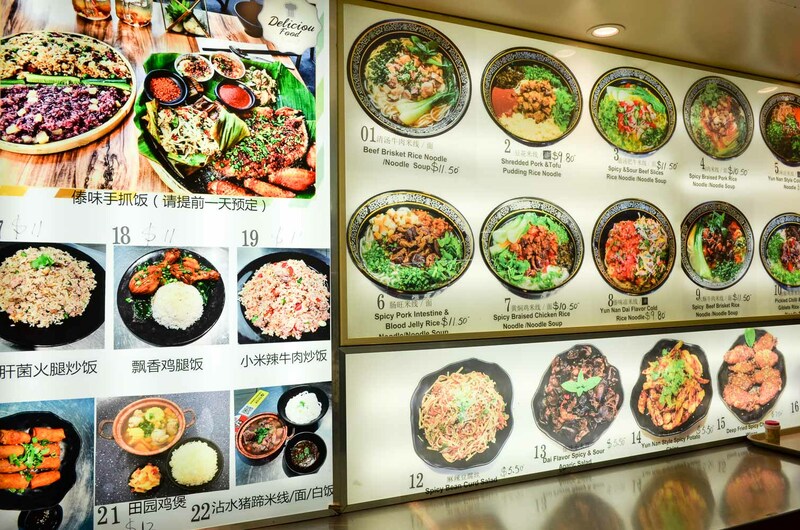 Another great new stall graces the hallowed halls of Chinatown's Eating World food court. Replacing the much loved Hong Kong Kings Chef is a corker of a new stall - Yunnan Style Cuisine. 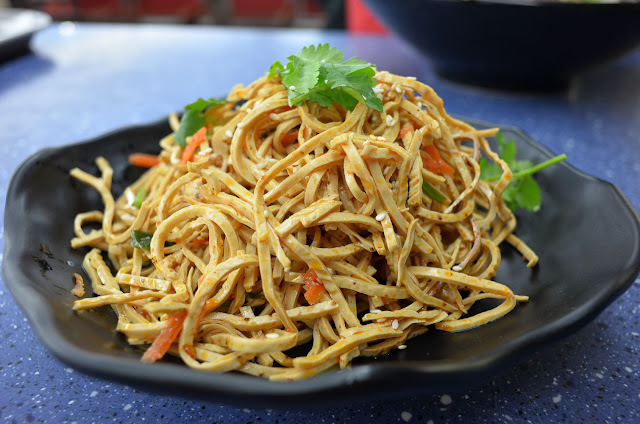 It's mostly noodles and so far it's all good, excellent in fact. The food court gods just keep on giving. 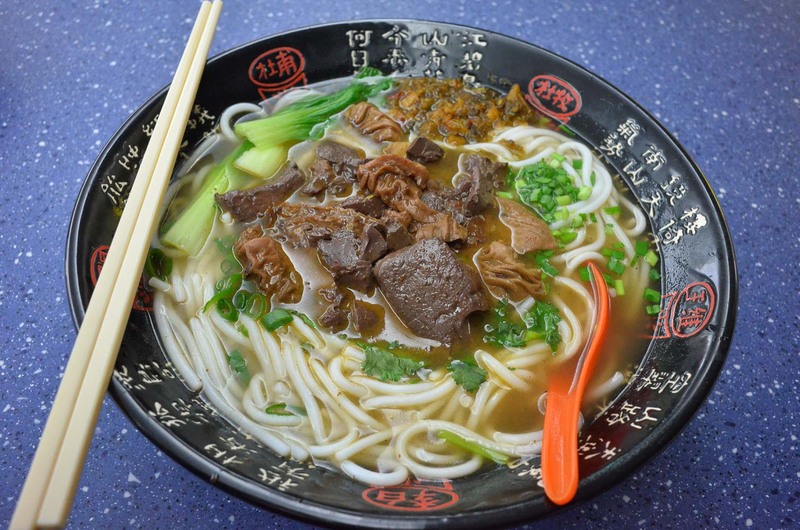 Beef brisket rice noodle soup - $11.50. A light and balanced clear broth in big bowl with not too many noodles. We love loads of broth so it's perfect for us. Plenty of super soft brisket, the fatty bits were especially mouth melty. 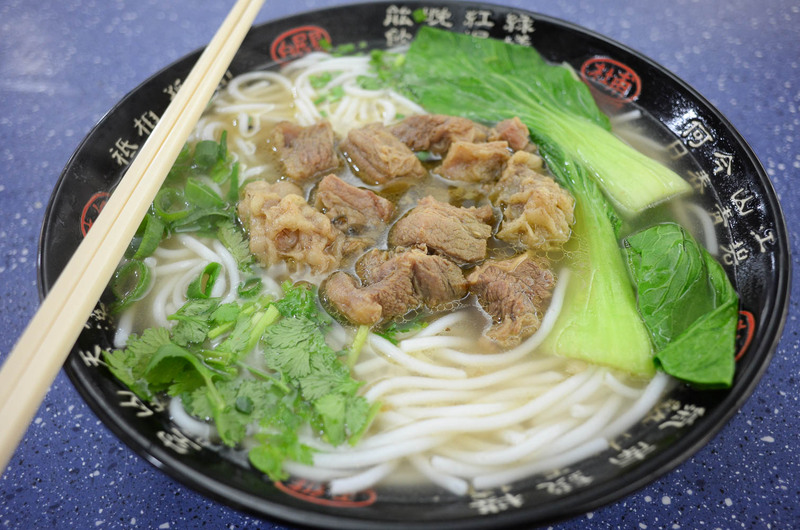 Spicy braised pork rice noodle soup (or dry) - $10.50. 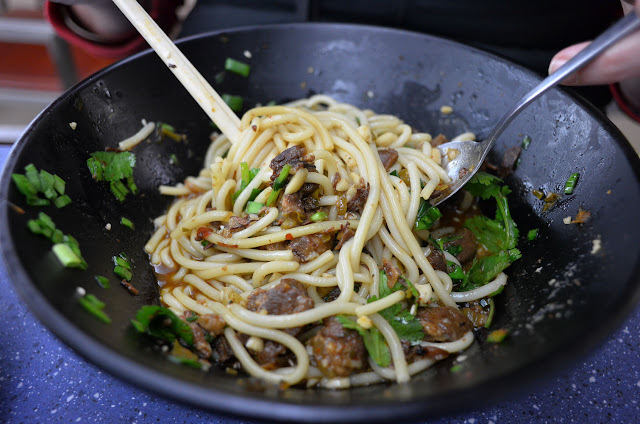 Similar to above but with slow cooked spicy pork belly and a hearty dash of chili oil. Shredded pork & tofu pudding rice noodle - $9.80. A big, filling serve of spaghetti-like noodles, spicy slow cooked fatty pork (belly? ), crushed nuts and chunks of soft tofu. We're familiar with all the flavours but never had this particular combo in one bowl before - it works a treat. 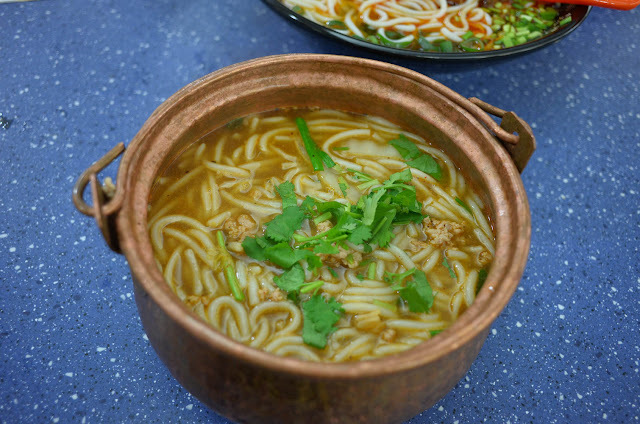 Special with no English name on the wall - a gentle and not-so-spicy soup with pork mince and rice noodles, about $10. Yun nan style spicy potato chips - $5.50. 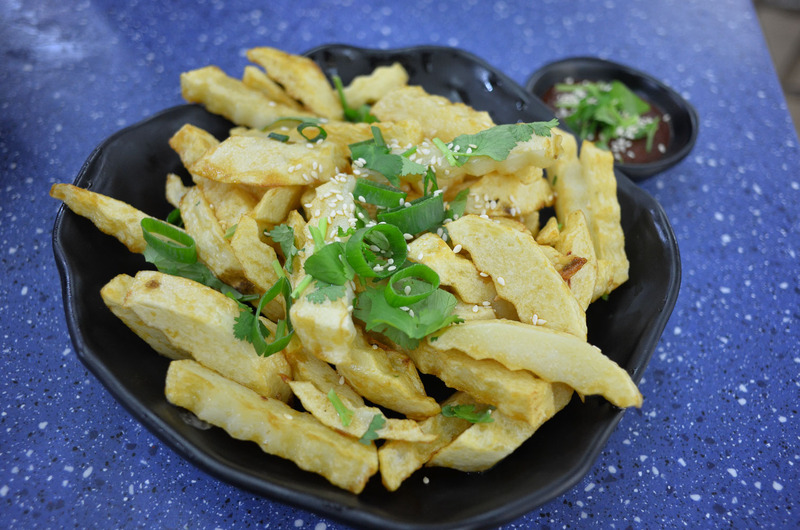 Crinkle cut chips cooked Chinese style, a little less cooked than western style, just like we've had on the streets of China. Served with a spicy dip which reminds us of Korean chili paste but with a fermenty-funky note to it. 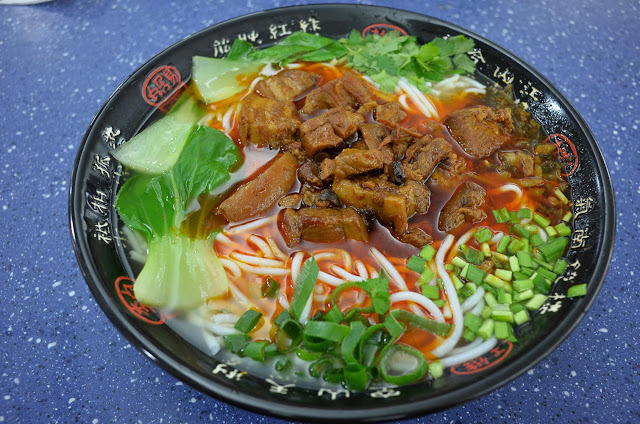 Spicy pork intestine and bloody jelly rice noodle soup (or dry) - $11.50. A gentle broth that gets further infused with intestines as you progress through the bowl, a touch of pickled veg for balance. 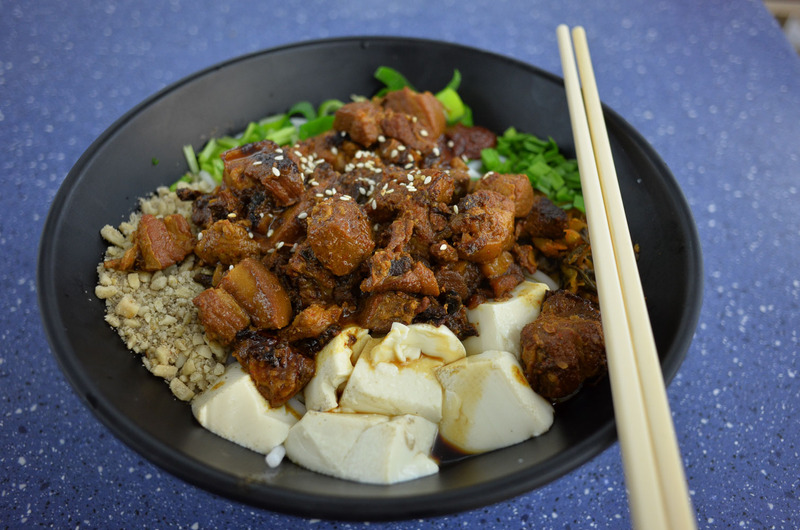 Spicy bean curd salad - $5.50. The texture of these cold slithers of hard tofu is wonderful, dressed with something lively with a slight chili bite. We ordered this one because it had no English name and it was $9.80. 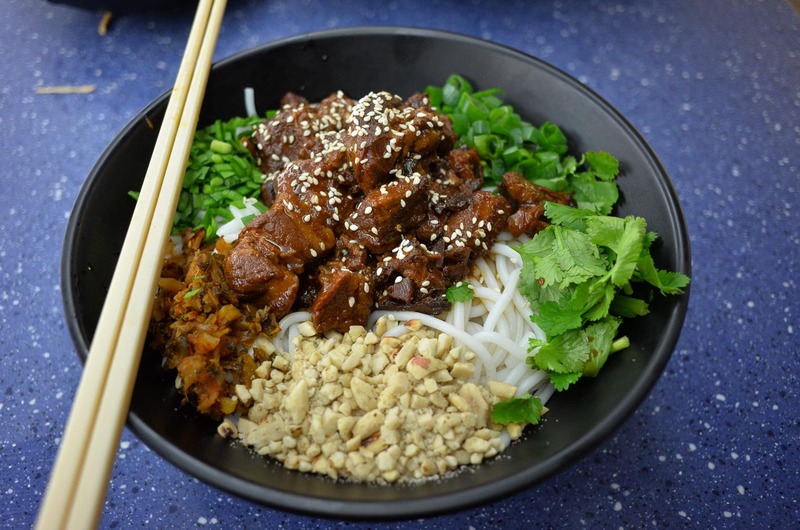 It's similar to one we had earlier - this version has super lovely slow cooked beef brisket, crushed peanuts, pickled veg, fresh coriander and parsely on top of a large server of fat rice noodles. Top shelf. Mix it all together and towards the bottom of the bowl you get a lovely primordial soup. 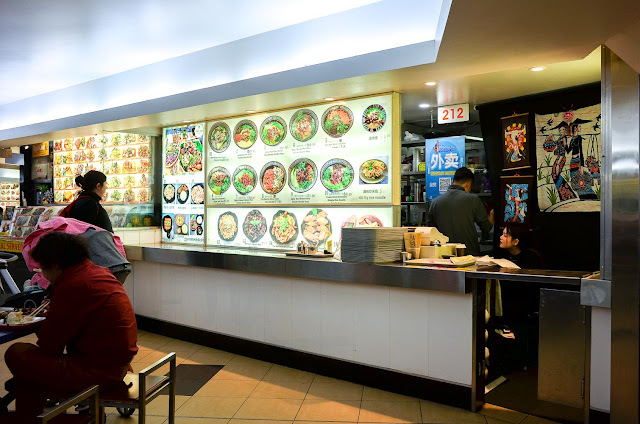 Yunnan Style Cuisine is the most glorious Eating World Food Court, Chinatown 25-59 Dixon St, Haymarket.